I found this little stool at a community yard sale a few weeks ago. I thought it was a cute shape and size, plus it was only a dollar. But the more I looked at it in my house, I decided it really wasn’t THAT cute and the wording on it was beginning to annoy me. It’s put together with staples, so it’s not real vintage. So out came the black spray paint, stencil and Mouse sander. The white spots are a happy mistake. They are part of the original phrase popping through from when I sanded it, but I think it makes it look like it has had paint splattered on it (that’s a good thing). 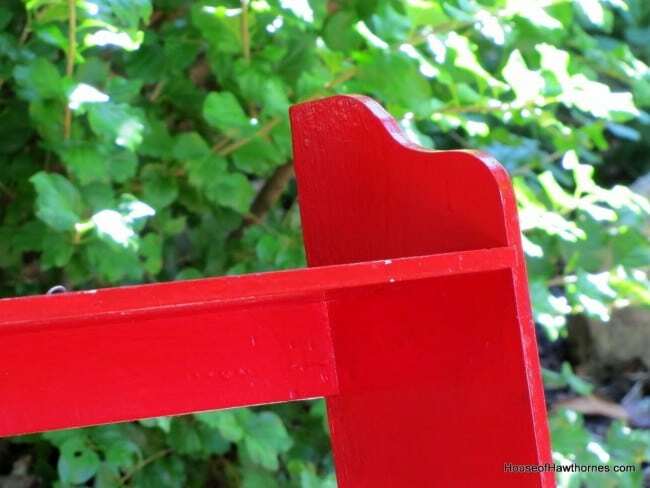 I also picked up this shelf that was painted a hideously shiny shade of red. I think it was $2.00. The red paint just had a weird sheen to it. Can you see the red shining up onto the tree? This was originally one of those 1950’s kitchen shelves that would have originally been painted white. I could see it with all sorts of cute chotchkies sitting on it. But my husband needed a shelf in his office more than I needed another place to display crap. So after my vision returned from staring at the shelf, I took out another can of black spray paint and here we are. Oh, and look. I still managed to display some of my crap on it. After I hung the shelf it was taking my husband too long to put his stuff on it, so I took matters into my own hand and put some cameras on it. They will probably go back to living in my office as soon as my husband puts his Battlestar Galactica Cylon and Budweiser mugs on it. I just love how, for a few dollars, a can of spray paint can make such a difference. Linking with Between Naps On the Porch‘s Metamorphosis Monday, Southern Hospitality‘s Today’s Thrifty Treasures and Coastal Charm‘s Nifty Thrifty Tuesday. 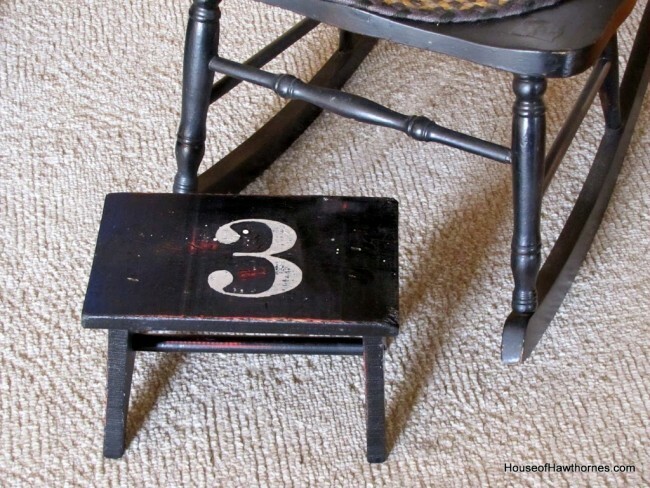 What a darling little $1.00 stool…love the number on it! Thanks for sharing it and the shelf at NTT!! the stool is adorable! Love all your vintage cameras. It all looks good except for that vintage Cub pennant! LOL I live in St louis remember! But I confess i grew up a cub fan too.. Your wonderful creativity is starting to work my nerves. Why can’t I think of this stuff? I had a little stool just like that when I was a kid. I used it to brush my teeth and then would have to haul it to the kitchen to see what mom was making on the counter. I love the cameras on it…hey, possession is 90% of the law!! You snooze you lose….let’s see, what else does my hubby say??? Love your re-do of the stool. Very cute! I also love that you admit you have “crap”- don’t we all?!! Lol…yes, my husband had a collection of homemade beer drinking trophies. They were lost in a tragic moving accident. 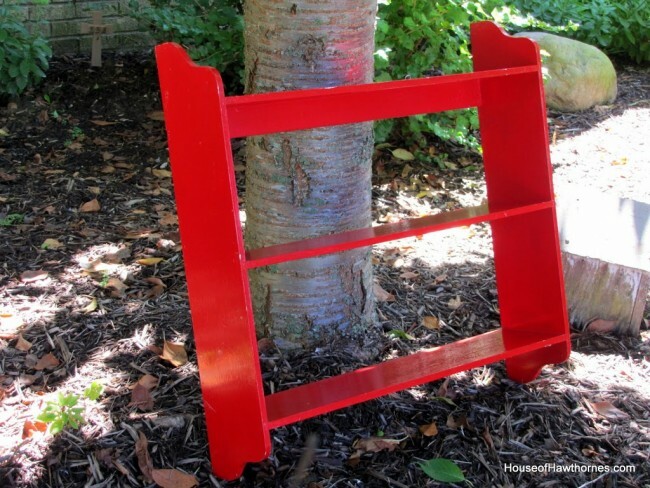 Love your shelf and the stool makeover! Love the cute stool and shelf. Your cameras are wonderful, too. I enjoy “meeting” other camera collectors. We’re Chicago fans, too. Cubs AND Sox! Great transformations, Pam. 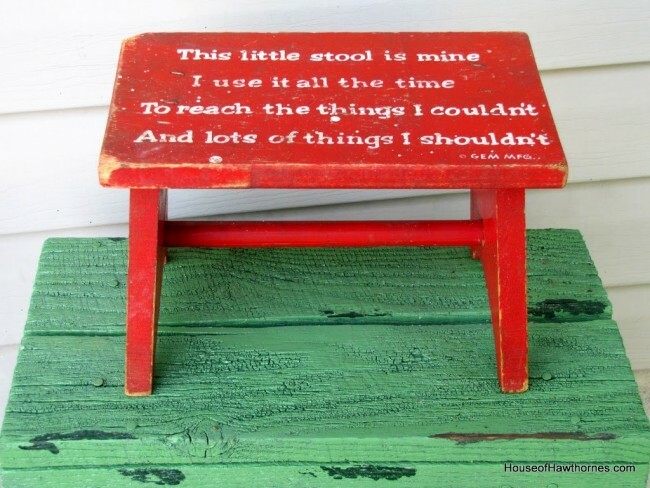 I love the little stool. Another brilliant transformation. I love everything about your stool. It’s perfect. These look great, Pam. I really love that stool. I thought of my daughter as I read the saying on it…she’s always into things she shouldn’t be. 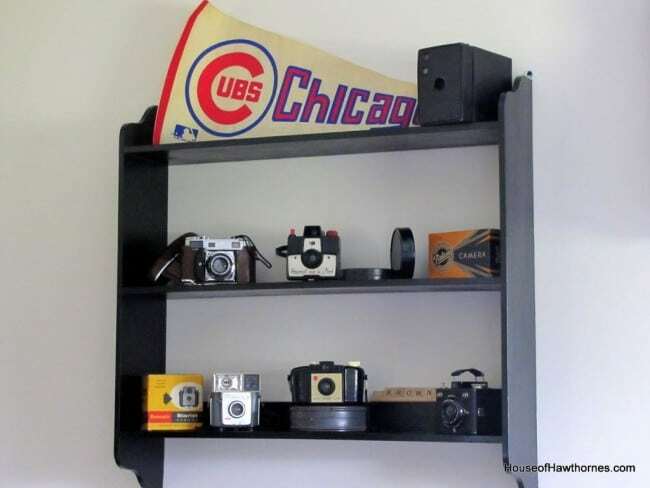 Your little stenciled stool is adorable, and the shelf looks great with your vintage cameras displayed. Got a giggle from the things your husband would put on it. Fabulous redo’s!! That little stool is just too cute! 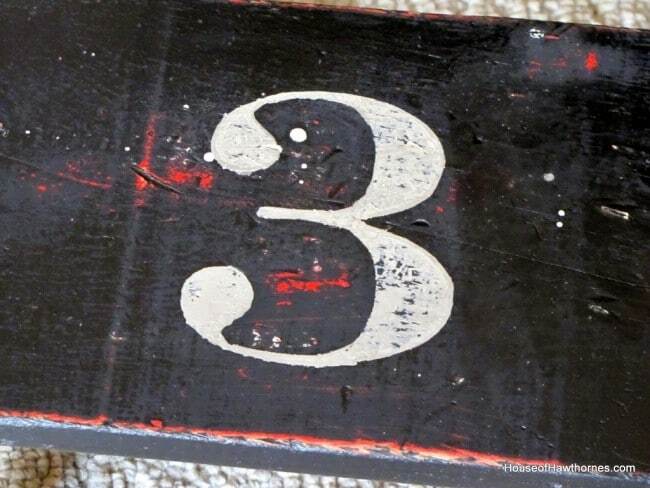 I love the stenciled number on it. My son got a similar stool like that for a baby gift way back when. I still have it….problem is….the wording on ours is embossed on the wood….no painting over it to get of it! Love your little stool Pam! It looks so perfect and I agree, so much better. The cute little stool looks so much better now! It’ so cute. CUTE! I love how the red distressed through it too. Nice job Pam! Spray paint is wonderful stuff. I love how the little stool came out! Very cute. I love that shelf and now I want one to put out my small collection of cameras!